Around March last year I travelled to the town Bad Hofgastein, an area about 60 miles away from the city of Salzburg. My main reason for going other than the stunning views of course was to learn how to ski and what better place than the alps. I could have picked a cheaper location to learn and even somewhere a little closer for example France which is basically on my doorstep, but I wanted to go to a country id never been before, and boy it didn’t disappoint. I used a travel company to book my entire trip called Crystal Ski Holidays, which allowed me to book accommodation, flights, transfers, ski school and rental equipment all in one neat little package which was ideal for a first time skier such as myself; I’d snowboarded before in Scotland when I was younger so could have just stuck to the familiar, but a lot of my friends ski so I wanted to learn as well, all together I would say this trip cost (excluded buying stuff there) £850 roughly, although it would have been less if I didn’t A. Need to go to Ski School or B. hire equipment. I stayed in the most beautiful hotel in Bad Hofgastein, called the Impuls Hotel Tirol. 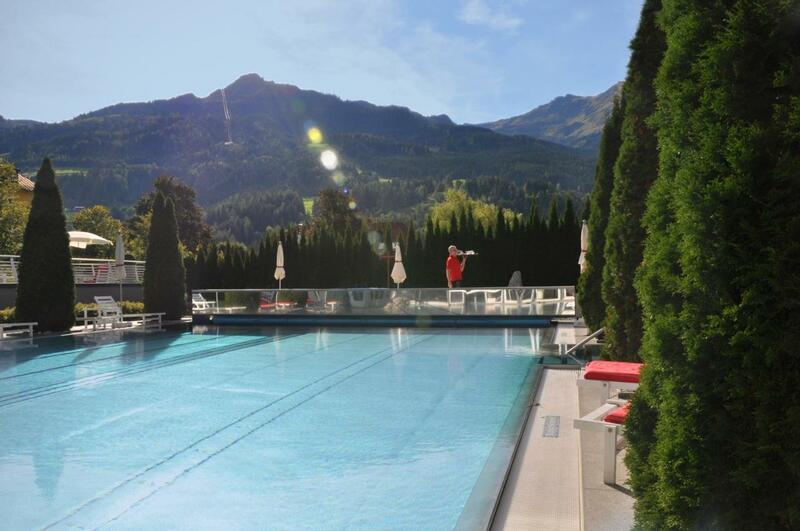 A modern yet traditional style 4 star hotel, with apartment style rooms, an indoor and outdoor pool looking out to the mountains (image below) and of course a spa. Once I had arrived at the hotel a member of the crystal ski team is there to meet you and had you all your passes and answer any of your questions, they were extremely helpful and could not fault their customer service. On my first full day I got the ski bus to Gastein, where I was kitted out and met the rest of the ski school, ski school is great for meeting new people, I met a lovely lady called Nin from Thailand who was also a complete beginner so we were able to push each other on and laugh at each other when we fell (which was a lot) The ski school lasts 5 days, which would have been the perfect amount of time to properly get comfortable with skiing. Oh clumsy me… on the 4th day of ski school I had a little fall and injured both my feet so was unable to finish the entire course, if I had I would have probably been way more confident skiing about now! luckily this didn’t happen right at the beginning of the trip! I told one of the reps about my accident and they recommended to me a few “non ski” things I could do for my remaining 2 days in Austria. After my accident I decided to rest my feet and take full advantage of the hotel spa. if your ever in Austria or Germany I would highly recommend getting a back massage, if you can take the pain that is, there’s nothing relaxing about it! but you do feel the benefits afterwards. On my last full day a travelled to very small quiet village in Bad Gastein called Mozart-Platz, which has an amazing waterfall with a small cafe overlooking it. Theres also a delicious bakery, and a short hike to a breathtaking view-point of the entire valley and surrounding mountains (image below) I’d highly recommend a visit here. If you book a deep cleansing facial which I often do when I travel then, bear in mind that in Austria this can sometimes mean full on Micro-dermabrasion, which for those that don’t know is basically someone holding an electric sander to you face!